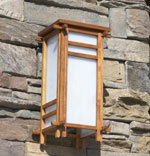 Often called “prairie style”, mission lighting is reminiscent of the Frank Lloyd Wright school of architecture, and is enormously popular today. Several vendors offer a wide range of mission style and early electric lighting designed to complement your new FLW home or remodel. Mission styling is a great way to change the character of a 1950’s ranch home as well.